This recipe is not only easy to make, it provides a very flavorful one-pan chicken and vegetable bake in about 30 minutes. 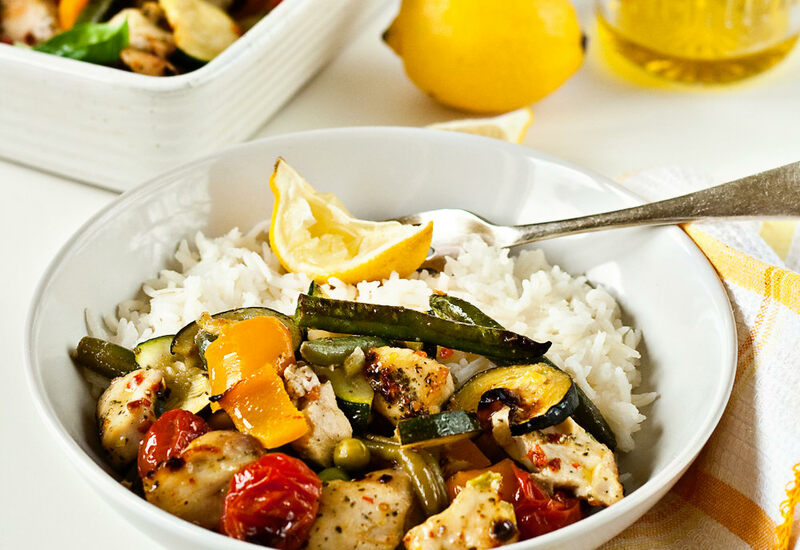 Cubed chicken breast is roasted with a rainbow of healthy and delicious vegetables, including red bell pepper, fresh green zucchini and peas, runner beans, and juicy red plum tomatoes. The entire dish is seasoned with a blend of basil, chili flakes, coriander, garlic, and oregano. It is brightened with a squeeze of lemon juice and a drizzle of olive oil. Try this one for a quick family-friendly dinner idea! If you have the time, combine the herbs and spices with the olive oil and lemon juice and marinate the chicken for a few hours. It will be super flavorful and juicy. Serve with extra lemon wedges for each person to squeeze over their own dish for a fresh lemony pop. Per Serving: 670 calories; 27g fat; 62.8g carbohydrates; 52g protein; 103mg cholesterol; 903mg sodium. One pot recipes are great for weeknights. I love that we have the option for frozen veggies, but it being summer and all I opted for some fresh beans and peas. Lemon juice is turning into my favorite kitchen staple to season almost any dish! The seasoning combination is perfect and its great for a weeknight meal after a busy day at work. I used chicken thighs instead of breasts for this dish. Sheet pan dinners are definitely a favorite, and this recipe is one of my favorites. The seasoning blend is delicious, it's my go-to. It’s easy enough but I’m confused why this came up when looking for directions for my Mealthy pot.